As told by Edithe Pereira (archaeologist of the Goeldi Museum), in his words: “Monte Alegre has always been known, in terms of archaeology by the rock paintings in a range of mountains located about 40 km west of the municipal headquarters. The interest in these paintings dates back to the 18th century, when an anonymous visitor and/or a Jesuit left, the year of his visit – 1764 – and the initials HIS, painted at the Serra da Lua site” [Excerpt from the book A Arte Rupestre de Monte Alegre, by Edithe Pereira]. These paintings can be seen within the State Park of Monte Alegre (Pará) that houses important archaeological sites, testimonies of ancient cultures that inhabited the region thousands of years ago. 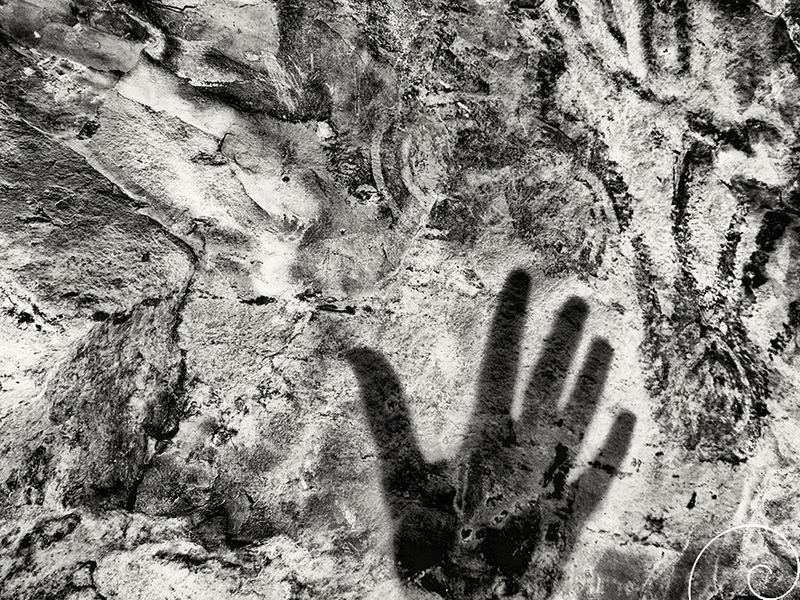 In the photograph, taken in Serra da Lua, the play of images like a confrontation of temporalities, by the look of the one who now wonders about these ancient paintings, inquires about the meanings and gestures of people that created such images on the stone. Text and Image: Silvio Luiz Cordeiro.